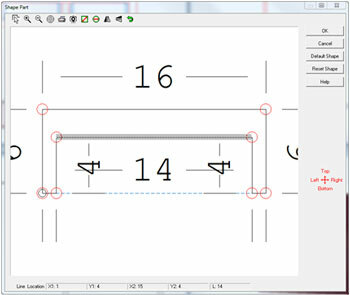 While we have been able to shape parts of cabinets in Multi Cross Section for quite a while, there are some new features in V 2011 R1 that will make this easier and more flexible. Today we’ll look at a few of the shape part features. Start with a cabinet such as this Face Frame base. Highlight the cabinet and hit Enter or choose Multi Cross Section from the menu. Once in Multi Cross Section, move your slice point to show the face frame on the front view. Highlight the left bottom rail. Choose Shape –Modify from the menu to get to the shape modification screen. Click on the bottom edge and choose Add Break Point. Do this twice. Now click on one break point and choose Position from the menu. Tie this break point to a corner node so it retains that relationship if the part subsequently changes in size, select the Bottom Right node in this case. Select the other break point and reference it to the Bottom Left corner. 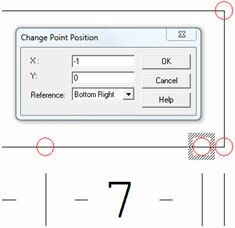 After referencing the break points, select the bottom edge segment and move it up. Now check the referencing of the new break points. Make sure they are tied to the nodes you desire. Next, double click on the inside break point and modify it to a radius. I used 3” for this example. The next corner will offer the Quick radius value last entered. Choose that. Choose OK and close out of the Shape Part dialog. Now click on the shaped rail and choose Shape – Copy from the <RB> menu. Click on the other bottom rail and choose Shape – Paste from the <RB> menu to paste the shape. You can also use Ctrl +C and Ctrl + V to copy / paste the shape. Click the Save icon, ,or choose to view the elevation or floor plan and then Save Dynamically. Now, when the cabinet is modified, the shape will be retained and adjust with the cabinet. This feature is available in Cabnetware V 2011 R1 Ulimate.